On the basic of design concept of reliability, high efficiency and endurance, The electrical motor has the form of a thin ring. Its stator is incorporated in the tunnel and its rotor carries propeller blades. Waterflow through the unit is unobstructed since there is no gearbox in the tunnel, nor are struts needed to support a hub. Together these factors give a high total efficiency and reduced noise and vibration. According to the different type of propeller, It can be installed vertically or horizontally. 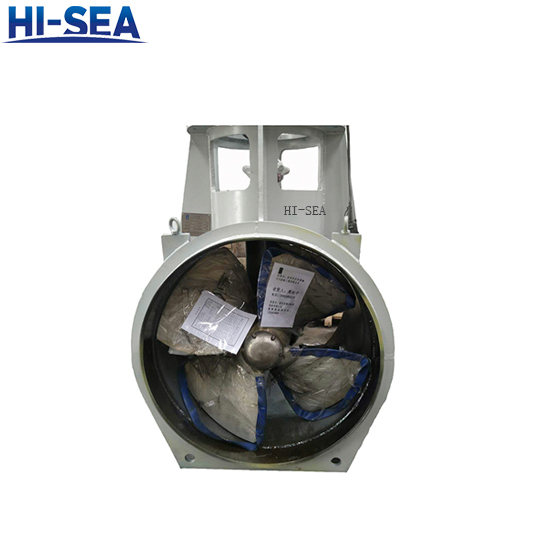 Tunnel thruster are particularly useful when maneuvering in ports, shallow and coastal waters and waterways. The use of tunnel thruster shorten the time of maneuvering and reduce costs of to-wage. Tunnel thrusters are particularly useful when manoeuvring in ports, shallow and coastal waters and waterways. The use of tunnel thrusters shorten the time of manoeuvring and reduce costs of towage. 1.Optimized combination of diameter-rotate speed of propeller, that improve propulsion efficiency; In the same thrust force we have smaller diameter, improve the ratio of utilization of cabin. 2.Skew blade and large disk ratio, reduce vibration and improve cavitation performance. 3.Gear and bearing have high strength and long longevity, and dipped into oil to got better lubrication and cooling effect, which improving the reliability of TP. 4.Underwater structure are optimized so that it have rational construction, which convenient for maintenance and repairing. 5.Tail shaft sealing are enough reliable sealing, meet the strict requirements of anti-pollution law of sea and ocean environment. 7.Low noise and vibration, installed vertically or horizontally, suitable for Transportation vessel, tugboat, ocean engineering vessel, ro/ro ship, cargo liner. 8.We can design and manufacture the product according to client's drawing or sample.